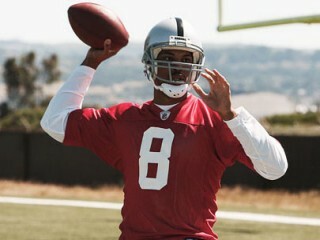 Birthplace : Laurel, Mississippi, U.S.
Jason Campbell is an American football quarterback for the Oakland Raiders of the National Football League. * Has completed 1,002-of-1,637 career passing attempts (61.2%) for 10,860 yards, 55 touchdowns and 38 interceptions with a career passer rating of 82.3. * Finished Redskins career ranked sixth all-time in club history in passing yards (10,860), sixth in passing attempts (1,637), fifth in completions (1,002), tied for seventh in touchdown passes (55) and second in passer rating (80.4%). * Owns the highest career completion percentage (61.2%) in Redskins history (minimum 1,000 attempts). * Has played in 52 career games (all starts). * Holds Redskins record with 271 consecutive passes without an interception (during parts of the 2007 and 2008 seasons) – marking the fifth longest streak in NFL history and the longest since QB Rich Gannon threw 277 passes without an interception for Oakland in 2000. * Set a single game career high in passing yards (367) vs. New Orleans (12/6/09). * Owns six career 300-yard passing games – 348, at Dallas, 11/18/07; 328, at Detroit, 10/26/08; 321, vs. New Orleans, 9/14/08 and 301, at Tampa Bay, 11/25/07; 340, at Detroit 9/27/09; 367, vs. New Orleans 12/6/09. * Has five career touchdown passes of 50 or more yards – 66 yards to TE Chris Cooley vs. Carolina (11/26/06); 67 yards to WR Santana Moss vs. New Orleans (9/14/08); 50 yards to Moss at Detroit (10/26/08); 59 yards to Moss at. Detroit (9/27/09) and 59 yards to Moss vs. Tampa Bay (10/04/09). * Made his NFL debut as a starter against the Tampa Bay Buccaneers on November 19, 2006. * Played and started in all 16 regular season games. * Named a team captain. * Finished the season with career highs in passing yards (3,618), touchdown passes (20), completion percentage (64.5%) and passer rating (86.4). * Had a pair of 300-yard passing games at Detroit (9/27) and vs. New Orleans (12/6). * Completed 27-of-41 (65.9%) passing attempts for 340 yards with two touchdowns and one interception at Detroit (9/27), including a 59-yard touchdown to WR Santana Moss. * His 367 passing yards marked the most in a single game by a Redskins quarterback since Brad Johnson set the franchise record with 471 yards at San Francisco on December 26, 1999. * His eight touchdown passes from Weeks 12-15 were the most over a four-game stretch in his career. * Recorded a passer rating of over 100.0 on five occasions: vs. Carolina (10/11), vs. Denver (11/15), vs. New Orleans (12/06), at Oakland (12/13) and at San Diego (1/3). * Connected on a career-long 84-yard pass completion to WR Malcolm Kelly at San Diego (1/4). * Completed 16-of-28 passing attempts for 222 yards and two touchdowns with a passer rating of 106.5 at Oakland (12/13) en route to a season-high 34 offensive points. * Started in a career-high 16regular seasongames and completed 315-of-506 passes (62.3%) for 3,245yards, 13 touchdowns and six interceptions. His passer rating was 84.3. * Ranked firstin the NFLin interception percentage (1.19), which also set a single-season franchise mark, besting the previous mark of 1.54 held by Mark Brunell in 2006.